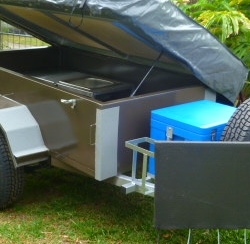 Top End Camper Trailers based in Cairns is one of the original camper trailer hire companies in Far North Queensland. Established since 1997 we run one of the largest off road camper trailer hire fleets in Queensland. With exquisite views there is not better place for exploring the best Cairns has to offer. We believe a camper trailer is more than a tent on a box trailer. Our unique Custom designs have been developed with the principle, camping in Comfort and Style. A Camper Trailer that looks nice but is built for the job. Australia is know for some of the best products in the world and we strive to give you the best materials available. Our camper trailers are Australian made, Australian designed and we build camper trailers to a high Standard. Top End Camper Trailer Rentals has been designing and manufacturing camper trailers since 1997. Living in Far north Queensland with diverse conditions from the rugged Out Back to remote beaches, there is no better place to have an office, the great out doors. With this ideal location we develop camper trailers that not only look good but are build for the camping adventurer.